This charming National Trust Felbrigg shed was recently installed for a customer based in Park Town, Oxfordshire. Selected from our range of FSC® certified Scandinavian Redwood timber National Trust buildings, the shed takes its name from the stunning Felbrigg Hall in Norfolk. As with all our timber garden buildings, it was delivered and assembled at the customer’s address by our in-house installations team. 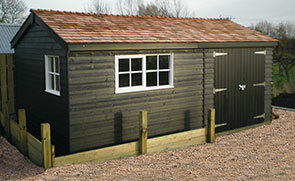 This handsome timber garden shed was recently installed for a customer based in Curbridge, Oxfordshire. Selected by the customer from our range of FSC® certified Scandinavian Redwood timber Classic Garden Sheds, the building was designed and built at our Norfolk factory before being both delivered and assembled at the customer’s specified delivery address. This charming National Trust shed was recently installed for a customer based in Cholsey, Oxfordshire. Designed and built at our factory in Norfolk, the shed was then both delivered and installed by our in-house fitting team. 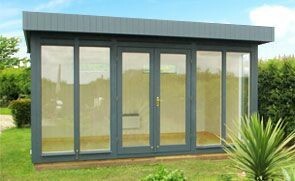 This stylish and contemporary Garden Studio was recently installed for a customer based in Carterton, Oxfordshire. Designed and hand-built at our factory in Norfolk, the studio was both delivered and installed by our expert, in-house fitting team. All our contemporary Salthouse Studios are designed and hand-built at our Norfolk factory before being delivered and installed by our expert fitting team. This 2.4 x 3.6m studio was recently installed for a customer based in Henley-on-Thames, Oxfordshire who wanted the perfect work-from-home office that also provides some extra outdoor storage space. 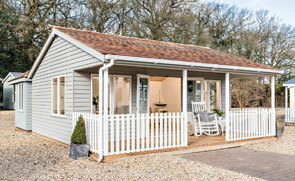 One of our attractive Weybourne Summerhouses was recently installed for a customer based in Bicester, Oxfordshire. Designed and hand-built at our Norfolk factory, the summerhouse is ideal for those with corner plots or for those wanting to save space. Alike the rest of our high-quality, FSC® certified timber buildings, the Summerhouse was delivered and installed by our expert fitting team. One of our FSC® certified timber garden sheds was recently delivered and installed by our expert in-house fitting team for a customer based in Chipping Norton, Oxfordshire, who wanted a classical styled garden shed for their gardening equipment and tools. This large Superior Shed was recently designed, hand-built and then delivered from our HQ in Norfolk and installed at our customers address in Henley-on-Thames, Oxfordshire. Our expert in-house fitting team install all of our buildings to ensure that our customers are happy with their building before leaving the property. This charming Blakeney Summerhouse was recently installed for a customer based in Henley-on-Thames, Oxfordshire. Designed and built at our Norfolk factory like all our other high-quality FSC® certified timber buildings, our Summerhouses are both delivered and installed by our expert, in-house fitting team. This classical Holkham was recently installed for a customer based in Lidstone, Oxfordshire. Measuring 3.6 x 4.2, this spacious Summerhouse was installed as a year-round retreat at the bottom of the customer’s picturesque garden, which looks out over the rolling hills of the Cotswolds. Among the rolling fields of Oxfordshire, in the quaint village of Great Bourton, our Cley Summerhouse sits nicely nestled within a customer’s garden, gazing out onto the Great British countryside. Recently installed atop an impressive base, this model boasts a cedar shingle tiled hipped roof, smooth shiplap cladding painted in Valtti Lizard and an easy entrance through the double doors. This complete storage solution in the form of one of Crane’s Superior Sheds was recently installed in Kindlington, Oxfordshire. Measuring 3.0 x 4.8m and having an internal partition accessed through an external door, there is so much flexibility with the final product. The internal shed space could be implemented as a workshop, whilst the side partition could be used purely for storage to keep everything tidy and efficient. This Ex-Display Cley Summerhouse was selected by a customer based in Chinnor, Oxfordshire after they paid a visit to their local show centre and found the building of their dreams. Designed and built by hand at our Norfolk factory, the summerhouse was then installed at the customer's address for use as a children's play room. 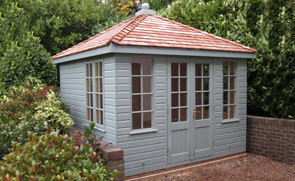 As with all of our wider range of summerhouses, they include delivery and installation as standard. Situated in Duns Tew, Oxfordshire, this 2.4 x 3.0m National Trust Felbrigg Garden Shed has been installed in our customer’s large, country garden to use as storage for the bikes and garden furniture that won’t fit in their garage. This Cley Summerhouse is 2.4 x 2.4m, and it has been installed in the tree-shaded back corner of our customer’s garden in Oxford, Oxfordshire to use as a quiet retreat, to read, relax and entertain in comfort in the warmer months of the year. At 3.0 x 7.8m in size, this is one of the largest Superior Sheds we have made for our customers, and it has been installed in our customer’s large garden in West Hagbourne, Oxfordshire to have for their gardener to keep their gardening equipment inside.